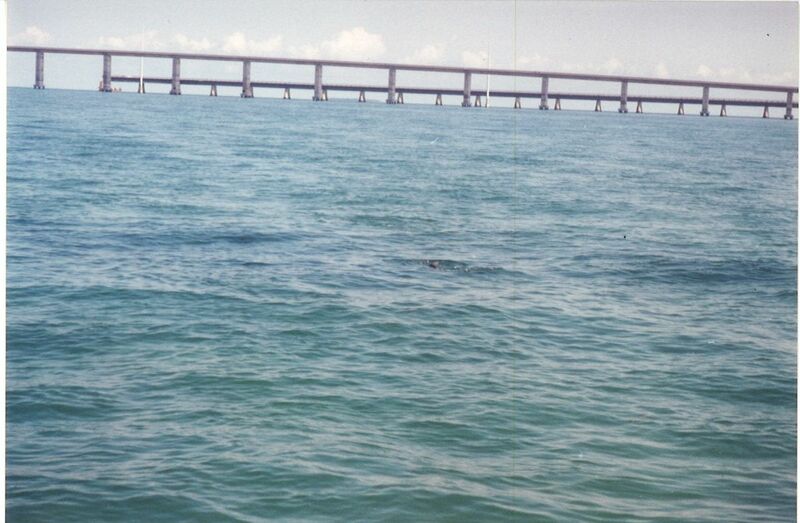 This post is a sequel to “Dustin Huff Swims Seven Mile Bridge”. That adventure occurred on the morning of June 18, 1995. As all anglers know, a great catch early in the day does not quench an anglers’ thirst for another shot at a great fish. So the miracle permit caught after Dustin went swimming did not cause us to head for the dock. After Dustin dried off and released the permit unharmed, we ate lunch. Lunch on a flats skiff is more like an eating contest than a meal. Experience has taught me that sought after fish just love swimming right up to the boat when it is tied off to the push pole, the rods are racked, and the anglers are eating. It is as if the fish know we are not prepared. Our solution is wolfing down the sandwiches and hopping back on the bow of the boat locked and loaded with rod in hand ready for the next shot at a bonefish or permit. As we ate, Dustin pointed to the water just off the edge of Boot Key as the land curved into a point marking the beginning of the channel ocean side of Seven Mile Bridge. “See that strip of white sand off the point?” Dustin pointed out a football field shaped area of brilliant white sand with lush turtle grass forming the sidelines. 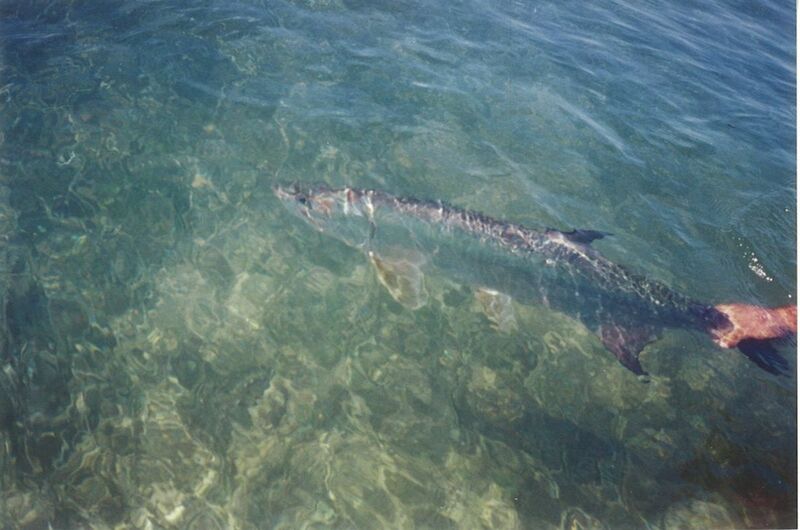 “Baby tarpon lay up on that bank on an incoming tide which is just starting now. I’m going to tie on shock leaders and we’ll see if we can jump a baby tarpon.” Dustin whipped out some 80 lb test line, tied the shock leaders on both our lines, and baited the hooks with fresh shrimp. He jumped up on the poling platform after dislodging the tied off push pole from the mucky bottom of the flat. The rods he rigged for the baby tarpon were the seven foot spinning rods we had been using earlier in the day for permit. Our reels were spooled with 10 lb. test Ande clear monofilament. Dustin spun the boat into the current and poled with the noontime sun directly overhead. Visibility was terrific. As we slowly moved towards the leading edge of the sandy bank, a couple of green missile shaped streaks were swimming slowly towards us. “Andy, cast as soon as you think you can reach the first fish. Drop the shrimp ten feet in front of the cruiser and let it sink.” Andy can really cast and did as instructed. The leading green shadow surged toward the sinking bait, opened its large maw and the shrimp simply disappeared. “Hit em, hit em, hit em!” Dustin screamed. Andy reeled down until he felt the weight of a hooked fish and did a terrific job setting the hook. We were in business. One problem. The tarpon was no baby and Andy was using 10 lb test line. The drag screamed as the fish made its first spirited run away from the skiff. Zzzzzzzzz. There is no better sound. Suddenly the water began to bulge in front of the huge tarpon as it launched into its first and only jump. Andy bowed to the fish and somehow the rig held. The fish was hooked! Tarpon anglers can attest that each fight of a hooked tarpon is unique. Just as we humans have distinct personalities, so do tarpon. This fish acted as if it was a cranky middle child with a chip on its shoulder. After the first jump, this nasty tempered tarpon headed for the bottom and stayed there. The tarpon had an apparent first destination of the Gulf Stream which runs North off the Florida coast. The Gulf Stream was first reported by the Spanish explorer Ponce de Leon in 1513 when he discovered Florida. In the area where we were fishing, the stream is known as the Florida Current. The speed of the Gulf Stream varies. In areas where it happens be narrower it is faster than in wider areas. The speed is up to 2 meters per second. Interestingly, the Gulf Stream meanders. It is like a river which has no banks. It can be experienced as close to a quarter-mile from the Florida coast in spots. Our tarpon must have sensed this because the fish swim directly towards the fast current offshore. Dustin fired up the boat as the tarpon began to tow the boat towards the ocean and into a depth of water where the push pole could not touch bottom. He also wanted to head off the fish before the bulldogging fish stripped Andy of the 300 yards of mono spooled on his Stradic 4000 reel. The fish cooperated and wheeled back towards shore. For years I had heard my buddy, Mitchie tell stories of tarpon fights. “Never let the fish rest. Better to lose him early than late. Their rasp like mouth will eventually wear through even an 100 lb leader.” Unfortunately, Andy knew none of this as this was his first tarpon. After about twenty minutes, the fish began to tow the boat. The fish had settled down and was swimming, the tide was slack, the drag was not slipping and Andy could not gain on the fish. Still the skiff moved forward. Dustin coached, ” Reel down to the fish and then lift, reel down lift, reel down lift.” We edged close enough to see the fish in the water. “How big?”, I whispered as I stood on the stern next to Dustin who had jumped down from the poling platform when he fired up the engine. He had not begun to pole again as he hoped Andy could keep just enough pressure on the tarpon so the drag would not slip resulting in the tarpon’s effort in towing the boat wearing the fish out. “Well over 100 lbs., so much for baby tarpon.” Dustin responded. Andy put very little pressure on the fish as he was inexperienced and I am sure could not imagine how much the 10 lb. mono would stretch if he tightened down the drag and pulled hard on the face of the giant. “We have no chance unless you put more pressure on the fish, Andy,” Dustin shouted. “Let me get the cooler up on the bow and you can sit down and use your hips to fight him.” After a few seconds, the cooler was on the bow and Andy settled down. He said nothing. We were two hours into the fight at that point. The fish swam and towed and Andy held on while we hoped for a miracle. With each passing minute, Andy’s shoulders slumped a little bit more as the fish fought on relentlessly. “The agitation factor is setting in,” whispered Dustin. For the tarpon, it was a life or death struggle. For Andy, it was a first time adventure with a very steep learning curve. About a mile away from the hookup point, Andy’s fish was joined by another tarpon which began swimming beside the hooked fish. It was as if the confused or perhaps mildly amused tarpon had reached out for reinforcements. We had just concluded the fourth hour of the fight. During the first couple of hours I tried to offer the occasional light hearted remark to break the tension. “When am I going to get to fish, Andy?” No reply. “Great job, Andy!” No reply. “Hang in there, Andy!” No reply. Slowly the fish pulled the skiff towards Marathon. Just as the shoreline begins to turn in towards Highway 1 and the High School flat, there is a small island about a quarter of a mile off the tip of Boot Key. 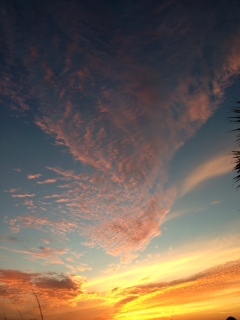 The island contained a gorgeous home with sunrise views in the morning and sunset vistas in the evening. Just off shore were a couple of boats were moored. As we approached the island, we noticed several small children happily swimming. The tarpon swam straight towards the splashing children. We followed. When the fish was twenty feet from the kids and their cheerful spirited commotion, the tarpon spooked from the water vibrations and bolted in the opposite direction. The companion free swimming tarpon spooked a moment later and as it spun sideways in a mirror image move of the other fish, its tail hit the taut line and the hooked tarpon was free. Over! The struggle was over. Andy was in a state of shock. As each hour passed, I had begun to think our chances of catching the giant improved. Dustin knew better. And now, Andy and I knew better. Andy spun on the cooler and faced us. He was drenched in sweat and I sensed a hint of exhausted relief on his face. This struggle with a great strong fish was like life’s moments of uncertainty where we are trapped in the quick sand of the unknown unable to move forward. With resolution of the uncertainty, we can begin to live again. 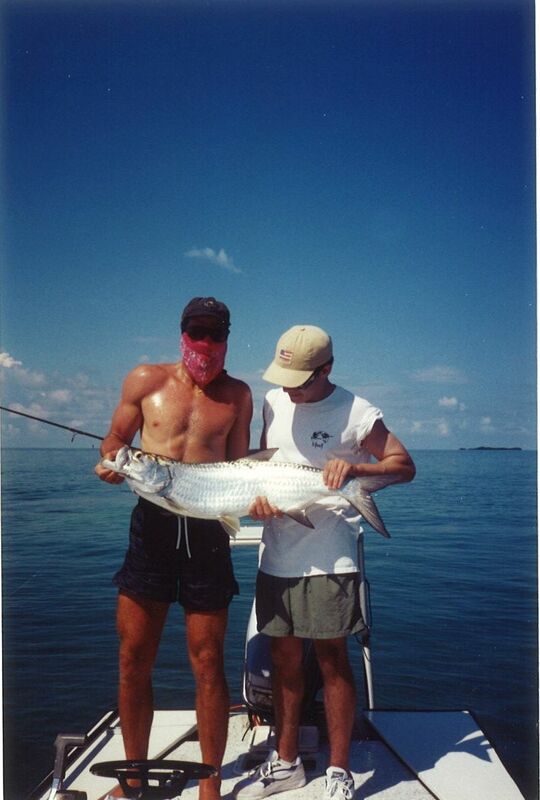 Once the giant tarpon was free, Andy could absorb the lessons of the fight preparing him to handle the next tarpon he encountered. An intense fish fight such as Andy’s also offers all of us a clear demonstration of how hard a wild creature will fight for life. With lessons learned, the next morning Dustin guided Andy to his first tarpon. Although Andy appears elated in the photo, I am confident that the memories of fighting a 100 plus lb tarpon on a bonefish rod and 10 lb test line are more vivid than the fish caught. This entry was posted in Fishing Stories and tagged Andy Rowe, Dustin Huff, Florida, Florida Keys, Tarpon by Tarpon Slam. Bookmark the permalink.